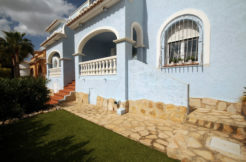 Impressive property in traditional style located in a quiet residential area near the golf course in Javea. This villa is perfectly maintained and almost completely renovated in 2010. The property is completely fenced and there are two entrances. There is a large pool, a beautiful outdoor kitchen and a tennis court. The villa consists of two floors: on the ground floor, the entrance to the villa by stairs with porch at the rear, hallway / entrance with guest toilet and laundry room, living room with fireplace and wood burner, dining room, kitchen, utility room, porch with access to the terrace, 2 bedrooms and bathroom. From the second entrance and also from the basement is an access to the apartment, consisting in living / sitting room, kitchen, bedroom and en suite bathroom. The bedroom has a sliding door to the terrace. On the first floor are a living room with fireplace, master bedroom with en suite bathroom and patio doors to the terrace. The basement consists of garage, guest toilet, covered terrace to the indoor bar, entrance hall with storage cupboard, gym / games room. From the outside there is access to storage and technical area of the pool. This space is ideal for creating a sauna and Turkish bath.